Tottenham are reportedly considering making a move for a new striker in this January’s transfer window and have money to spend. And according to a report from the Telegraph, Liverpool backup forward Divock Origi is one of the players who fits the profile of what they’re looking for. Although there’s no guarantee Spurs will make a ‘panic buy’ this winter, the report suggests they could make a move in the market if the right option becomes available. Origi hasn’t played a great deal for Liverpool so could be a decent candidate to come in and provide short-term cover for Tottenham after the injury to Harry Kane. The England international will be hard to replace up front, particularly with a player like Origi who hasn’t exactly done much to impress at Premier League level. 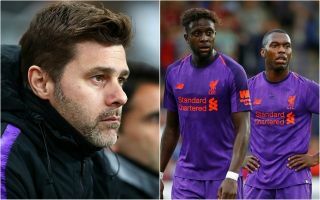 Still, the Belgian was once considered an exciting prospect when Liverpool snapped him up at a young age, and Mauricio Pochettino has a great record of improving players. Tottenham notably failed to sign anyone in the summer transfer window, but perhaps a move for someone this January now looks a tad more likely.